Carlton Scott pays $266.99 per month for his subsidized health insurance plan. He worries he and his neighbors would lose their insurance without the subsidy. LaTasha Perry says she couldn't afford the health plan offered by the community health center where she works. But with a subsidized plan, she has insurance and money left over "to buy food for my kids." Retired paramedic Charles Dalton is now disabled. He pays $149 each month for his subsidized health insurance. "If you get a helping hand," he says, "the last thing you need is for it to be snatched out from under you." In just a couple of months, the Supreme Court will rule on a major case concerning those subsidies. The question to be decided is whether the law authorized that financial help nationwide or just in the minority of states that set up their own insurance exchanges. A decision to take away those subsidies could leave millions without insurance. Attorney Tom Goldstein, who runs SCOTUSblog, has closely followed the case and says the law is ambiguous. "This is a real, serious question," he says. "The law doesn't tell you whether Congress wanted to limit the subsidies only to those states where the state itself went to the trouble of setting up the exchange, or whether Congress wanted everybody who needed the help to be able to get the subsidies." In my home state of Louisiana, a lot of people could be affected by the upcoming court decision. About 186,000 people there have used HealthCare.gov to buy insurance, and nearly 90 percent of them get subsidies. Here are the stories of a few of the people I spoke with. Carlton Scott is 63. Sitting at the kitchen table of his home in Prairieville, La., near Baton Rouge, Scott tells me he worked at a chemical plant for 30 years before he retired. Last fall his company let him know it was scaling back his retirement benefits. "Around October," he says, "they wrote me a letter saying [that] in December we'll no longer be covered." Those reduced benefits included Scott's health insurance, which he was really counting on. "I thought they would take me to my grave," he says. "I really thought the company would take me to my grave." He was deeply angry, and in a bind. 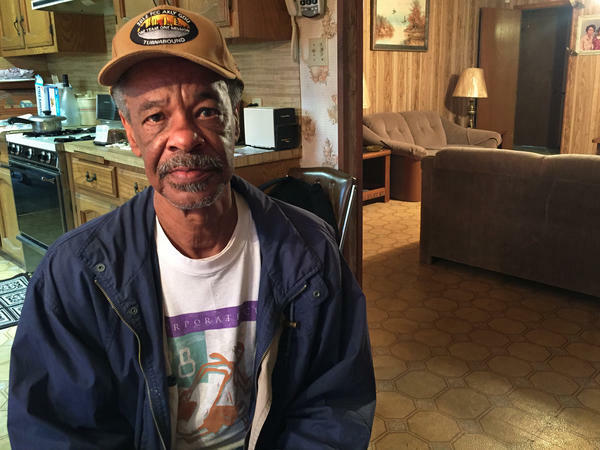 At 63, Scott is too young for Medicare, and Louisiana hasn't expanded Medicaid. Obamacare, he says, was a good option for him. He pays $266.99 per month, "to the penny," for his plan from BlueCross BlueShield of Louisiana. Like a lot of people I spoke with, Scott could rattle off the exact amount. Money is tight and people track their expenses carefully. If Scott loses his subsidy, he may eventually lose his health insurance, too. He could pay more for a little while if he has to, he says. He gets $2,600 a month between Social Security and his pension. But he worries about friends who don't make as much. "I got a friend of mine ... down the street," Scott says. "He gets Social Security and pension too. But it's not as much as mine — not half as much." When asked about the case soon to be decided by the justices of the Supreme Court, Scott laughs. "They all got insurance, too," he says. "I guarantee you that. They all got insurance." He thinks the court should "leave it like it is. I mean, what are people going to do? Get sick, go to the hospital [and say], 'I don't have insurance. Won't you please help me anyway?' " It just won't happen, he says. LaTasha Perry is at the other end of her career. She's 31 and works at the front desk of a community health center in Plaquemine, La. She's healthy and rarely needs a doctor, she says, but bought coverage under Obamacare because it was cheaper than paying the penalty. Perry's children have Medicaid as their health coverage. Her job offers health insurance, but she doesn't buy it. Like a lot of people who work but don't make a lot of money, she says she can't afford the insurance her company offers. "I would pay at least $100 a month for the insurance here," Perry says. "With my subsidy, I pay $13." That leaves her money for other necessities, she says. "Food for my kids. I'm a single parent. It's hard." 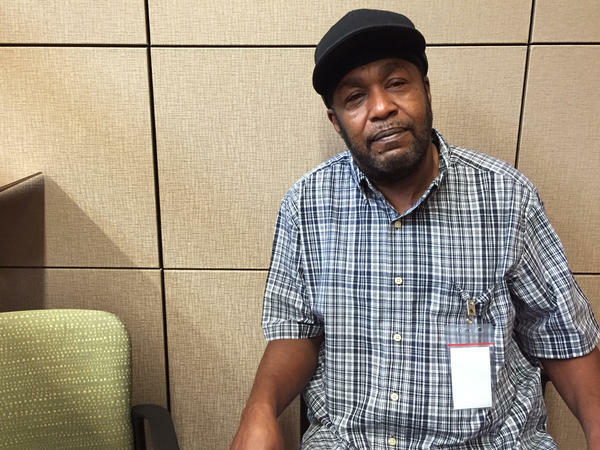 Charles Dalton, of Shreveport, was very glad to get Obamacare coverage. He's 64, and after retiring as a paramedic he didn't have any health insurance. Then he got sick. "I'm disabled," Dalton says. "But I would be totally incapacitated without seeing this doctor." Before the Affordable Care Act became law, insurance companies could take a person's health status into account when setting the price of the monthly premium and even refuse an applicant for health reasons. That used to make insurance unavailable or unaffordable for many sick people. And now — with subsidies — Dalton says he pays $149 a month. He hopes the Supreme Court doesn't touch the subsidies. "They're just going to make a difficult situation more difficult," Dalton says. The Affordable Care Act, he says, has helped make his existence "more livable." "You're not asking for a handout," Dalton says. "But if you get a helping hand, the last thing you need is for it to be snatched out from under you." Attorney Goldstein says the Supreme Court justices have a particularly tough job, trying to balance the specifics of the law with its human dimensions. "The consequences are so real and so powerful," Goldstein says, "that, if the challengers win here — and maybe they deserve to win, maybe it's what Congress intended — but it's hard to avoid the conclusion that millions of people would lose access to health insurance." 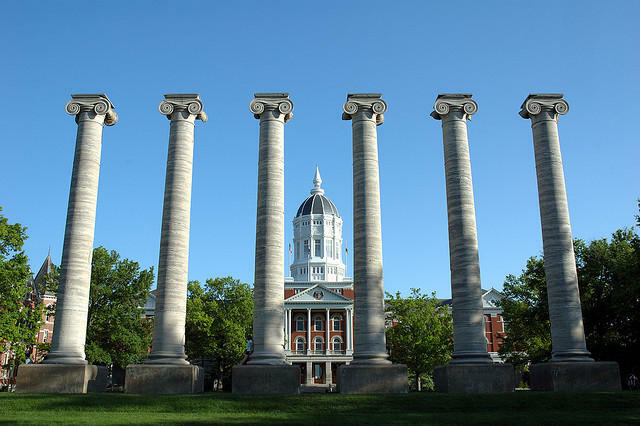 This story is part of NPR's reporting partnership with WNPR and Kaiser Health News. Copyright 2015 Connecticut Public Radio. To see more, visit http://www.wnpr.org. 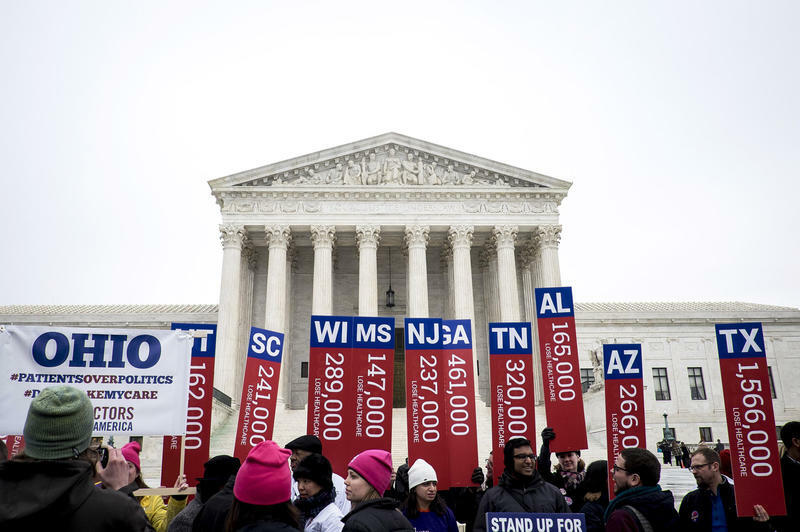 In just a couple of months, the Supreme Court will rule in a major case concerning the Affordable Care Act. The question is whether the law allowed for federal subsidies only in the minority of states that set up their own insurance exchanges, or if the law includes the majority of states that left the job of setting up exchanges to the federal government. And this could be a big deal. About three dozen states have exchanges created by the federal government. Taking away subsidies in those states could leave millions without insurance. MONTAGNE: For more, we reached Jeff Cohen of member station WNPR. He's spoken to people who rely on federal subsidies under the Affordable Care Act and joined us to talk about what they had to say. A warning - what you're about to hear contains language some might find offensive. JEFF COHEN, BYLINE: Hi, Renee. MONTAGNE: There's been a fair amount of coverage about the case before the Supreme Court, but remind us exactly what's at stake here. COHEN: Sure. The act does a lot of things, but one of the big ones is mandate that all Americans get health coverage or pay a penalty. So to help coax people to get that insurance, the federal government is subsidizing premiums for millions of Americans. But opponents say those subsidies are only for states that didn't use healthcare.gov. Attorney Tom Goldstein's been following the case. TOM GOLDSTEIN: This is a real serious question. The law is ambiguous. It doesn't tell you whether Congress wanted to limit the subsidies only to those states where the state itself went to the trouble of setting up the exchange or whether Congress wanted everybody who needed the help to be able to get the subsidies. COHEN: So that got us thinking, who are the people getting the subsidies, and who stands to lose them? MONTAGNE: And you went down to Louisiana. And out of all the three dozen or so states on healthcare.gov, why that state? COHEN: Well, the state is on healthcare.gov, where about 186,000 people have gotten health insurance, and nearly 90 percent of those people in Louisiana get subsidies. MONTAGNE: Tell us who you met. COHEN: I met a man named Carlton Scott. He's 63. And we sat at his kitchen table at the house he owns in a town called Prairieville. And he told me he worked at a chemical plant for 30 years before he retired, but now his company's scaling back his retiree benefits, including his health insurance, and that's something he was really counting on. CARLTON SCOTT: Around October, they wrote me a letter saying in December, they'll no longer have me covered. COHEN: Was it always your thought that, look, when I retire, I'm going to be covered? Was that how you thought about it? SCOTT: I thought they would take me to my grave. I really thought the company would take me to my grave. SCOTT: That pisses me off. I've been through 30 years and you come with this [expletive]. MONTAGNE: So you said he's 63, which would make him too young for Medicare. Obamacare then must've seemed like a great option. COHEN: Obamacare's a great option for him. SCOTT: I got Blue Shield Blue Cross of Louisiana. COHEN: Do you know what - roughly what you pay a month? SCOTT: Yeah, exactly to the penny. MONTAGNE: To the penny, he really knows. COHEN: He does. That's something I heard from a lot of people, too. Money's tight, and they know exactly what they're paying. MONTAGNE: Which gets us to the possibility that Mr. Scott could lose his subsidy on his health insurance. COHEN: That's right. And he said if he had to pay more, he could for a while. And he says it was the talk of the town when he and his colleagues got those letters canceling their health insurance. And now he's worried about his friends. SCOTT: Everybody don't make the same amount of money. I got a friend of mine staying down the street. He gets Social Security and pension, too, but it's not as much as mine - not half as mine. COHEN: The judges on the Supreme Court are considering a very technical question. SCOTT: They all got insurance, too (laughter). I guarantee you that. COHEN: Let's say they were sitting here. What would you say to them? SCOTT: Leave it like it is. What people going to do? MONTAGNE: Now, who else did you meet? COHEN: I met a woman named LaTasha Perry. 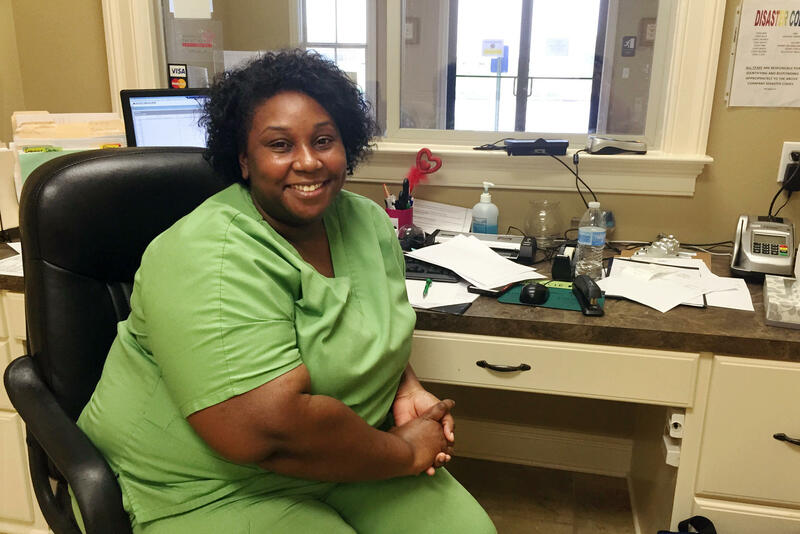 She's 31, and she works at the front desk of a community health center in Plaquemine, La. She got covered under Obamacare because it was cheaper than paying the penalty. She says her children are on Medicaid. But while her job offers her health insurance, she doesn't buy it. She's like a lot of those people who work but don't make a lot of money. She says she can't afford it. LATASHA PERRY: I would pay at least $100 a month for the insurance here. COHEN: And what is Obamacare? PERRY: With my subsidy, I pay $13. COHEN: And now, she says, she's got money left over for her family. PERRY: Food for my kids. I'm a single parent, so it's hard. MONTAGNE: And, Jeff, I gather you also went up to Shreveport and met people there. COHEN: I did. I met a man named Charles Dalton. And he's different from Perry because he actually wanted the coverage. He's 64. After he retired as a paramedic, he didn't have health insurance, but then he got sick. He says his condition is too personal to talk about. CHARLES DALTON: I would be totally incapacitated without seeing this doctor. MONTAGNE: And, of course, Obamacare won't allow insurers not to accept somebody even if they're sick, like this gentleman. COHEN: Exactly. That used to make insurance unaffordable for many sick people. And now with Obamacare, Dalton says he pays $149 a month. And he hopes that the Supreme Court doesn't touch the subsidies. DALTON: They just going to make a difficult situation more difficult. If you get a helping hand, the last thing you need is for it to be snatched from under you. COHEN: So, Renee, regardless of the politics, there are a lot of people like Dalton who fear the Supreme Court would be taking something away. Tom Goldstein, the attorney we heard from a few minutes ago, says the court has a tough job - balancing the law with the human dimensions of the case. MONTAGNE: And that is Jeff Cohen. He's a reporter with WNPR in Connecticut. He traveled to Louisiana to talk to people about Obamacare subsidies. He comes to us as part of a reporting partnership with Kaiser Health News. Thanks very much. COHEN: You're welcome. Transcript provided by NPR, Copyright NPR.